Aw, the applet stole 13 seconds from me. 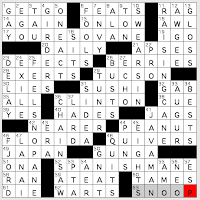 I've been in a mood all day, but luckily, this puzzle snapped me out of that before the applet took a little SIESTA (3D: [Sonora snooze]). 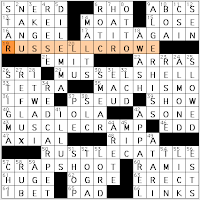 The crossword was very firm with me, in fact. ["Tough! "], it admonished me. 20A: "JUST DEAL WITH IT." 35A: "TOO BAD, SO SAD." (That one, I've never said. Is it a newer phrase, perhaps? It's in-the-language enough that there are t-shirts with that message.) 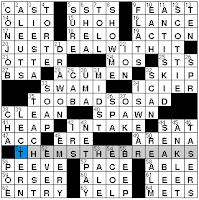 And my favorite, 51A: "THEM'S THE BREAKS." There's something about a crossword entry that's ungrammatical but a familiar colloquial phrase that strikes me the right way. CON JOB is good, too—that's a [Swindler's work]. SPR., the abbreviation for "spring," is clued with [It begins in Mar. ]; I wouldn't like this except that September 22 is the autumnal equinox so SPR. is a timely opposite. "I SWEAR!" is clued as ["No fooling! "]; it's also the name of constructor Vic Fleming's newspaper column. SOAP and CLEAN cross each other, but while the former is a [Laundromat buy], CLEAN is clued as [Completely off drugs]. It feels like I've seen ORSER in about five puzzles over the last month. Who's that? [1987 world figure skating champion Brian], that's who. Matt Jones's Jonesin' crossword, "Remember the Date: we'll make it three times as easy for you"
58A. 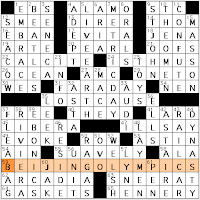 The BEIJING OLYMPICS were an [Event with an opening on 8/8/08, since 8 is a lucky number]. 2D. [With "The," band with a remastered box set of albums released 9/9/09 (the date referring to one of their songs)] clues BEATLES. Do you remember the SNL skit with Dana Carvey and somebody as Paul and John, running a fried chicken fast food joint and calling out to the next customer, "Number nine? Number nine? ...Number ten?" 5D. LIVE EARTH was a [Multi-continent charity concert held on 7/7/07]. 7D. METRIC DAY is new to me. That's an [International standardized measurement promotion that may get more attention next year, since it's held on 10/10/10]. 10D. Ah. 666, the mark of the beast! THE OMEN is the [Horror movie remake officially released on 6/6/06 (at 6:06:06 a.m.)]. 37D. A [Crappy motel]'s a FLEABAG. 45A. All right, I had no idea what this one was and worked the crossings: LIBERA [___ Me (Requiem Mass movement)]. 22A. Did you know that [Limestone, mostly] is composed of CALCITE? 17A. [Song about wind direction?] "YOU'RE SO VANE." Hey, don't say I didn't warn you! I like this one a lot, but I'm not convinced the cluing is as focused as it could be. Maybe this is too literal, but I was thinkin' along the lines of [Song about a human wind-direction device?] Regardless, I find this one to be a funny idea indeed! 25D. [Finds a broken window?] FEELS NO PANE. This is just awful—and I mean that as high praise. It creates a great visual, too. I just want whoever sticks his/her arm through this window to be very careful. A little shard or two of glass left behind and you'll be feelin' plenty o' pain! 52A. [Hair on an Andalusian horse] SPANISH MANE (and check out that link for a horse with one serious mane!). Not to be confused with that coastal/colonial territory known as the Spanish Main. Interestingly, this included (now) [Home of the Gators], FLORIDA and ALA(bama), [Mobile st.]. Yesterday, you may recall, I was trying to squeeze from the get-go into Gail Grabowski's puzzle. Well, thank you, Ray, for appropriately making 1A [Starting point] GET-GO. I'd love to attribute the appearance of this word to my gift for ESP, but that really is a [Fortuneteller's gift] and definitely not mine. This was mere coincidence (but I love it all the same!). From the Okefenokee Swamp (in Georgia—and also once part of the aforementioned Spanish Main) we also get [Walt Kelly's] "I GO [POGO"] which is not only a book of Pogo comic strips (published in the early 1950s) but also what sounds like a terrific (if difficult to actually get a viewable copy of) little animated movie. The bottom third of the puzzle is loaded with references that take us globetrotting. There's FJORD [Long narrow inlet], a feature I always associate with Scandinavia (I know they can be found elsewhere...); JAPAN [Where noh originated] (and SUSHI, the [Seaweed-wrapped food] we get from Japan); LANAI, that Hawaiian [Island near Molokai]; "GUNGA [Din"], which conjures up Kipling's India; and even Indonesia's JAVA MAN [Fossil discovery of 1891]. There's underworld action as well, with HADES [Abode of the dead]. More in my wheelhouse is this kind of info: Johnny Mercer wrote the lyrics and Rube Bloom the music for the standard "FOOLS Rush In"—or as Ray clues it [They rush in where angels fear to tread]. Many, many folks've recorded this song, but for his version, Ricky Nelson made it SIDE A [Half of a 45]; the B Side was Gerry Coffin and Carole King's "Down Home." Take a listen to Side A. 19A. RUSSELL CROWE is [George who played Sulu on "Star Trek"]. No, wait, that's TAKEI. RUSSELL's ["A Beautiful Mind" star]. 29A. [Certain mollusk's protection] is a MUSSEL SHELL. Remember the '80s Squeeze song, "Pulling Mussels (From the Shell)"? 43A. [Marathoner's bane] is a MUSCLE CRAMP. I wonder how my cousin's boyfriend did in last Sunday's Berlin Marathon. 50A. To [Steal a herd] is to RUSTLE CATTLE. Has anyone ever been arrested for rustling paper bags? The short fill in this puzzle is nothing special (it seldom is), but the longer fill is terrific. CRAPSHOOT is a [Gambling metaphor for a risky venture]. ALGER HISS was a [Suspected Soviet spy of the McCarthy era]. If they're AT IT AGAIN, they're [Quarreling once more]; if you're lucky, you're not using this phrase too often. I didn't see the Emmys RED CARPET ([It's rolled out for celebs]) on Sunday. MACHISMO is a highly overrated [Tough-guy trait]. Overall, a good Tuesday solve, with a fresh and gettable theme, smooth fill, and some sparkle.